There you are, in that beautiful little Grand Canyon side canyon at the end of the day – boots off, feet up, basking in the peacefulness of this idyllic setting when an incredibly loud “BRRURT!!!…BRRURT!! !” interrupts the silence and startles you awake. This is the most common frog in GC, and can usually be found within a couple of hops from perennial water sources such as side streams, springs, and water pockets. At maturity it is 2 ¼ inches long, gray to coppery in tone, and has the ability to change its color or add spots like a chameleon to better blend into its environment. It has bulbous toe tips with sticky pads and extra cartilage segments between the last two toes that allow the toes to swivel and keep flat against any surface. Mature males have dusky (darker) throat patches while females have light tan throats matching their bellies. 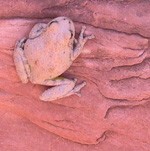 Though called a tree frog, it is most often found basking in the sun on rocks and boulders. It is truly fond of sunbathing, an activity that biologists have theorized it may do to increase its metabolism. It can apparently keep from broiling in the heat by evaporating water from its skin and from the occasional dip back into the water to cool off and drink…sound like anyone you know? Mating begins usually in March or April when the evening water temperature warms up to about 55 degrees, and the cacophony of froggy courting serenades last until July or August. Eggs are laid in masses of about 500 in shallow, still pools of water and take about 70 days to hatch and develop into mature frogs. The warmer the water temperature, the faster the development, but shallower, warmer pools also have the possibility of drying up all together before the next generation can hop out, making where you lay your eggs a kind of reproductive Russian roulette. Only about 2% of eggs laid will make it to become frogs, and only 10% of those will survive the first year to go on and breed the next spring. Amazing statistics when it sounds like there are so many of them! So next time that you hear what you think is a herd of goats in that beautiful little side canyon, know that it is the next generation of the sunbathing canyon tree frog in the making. Go for it little fellas! For a wonderful description on the Canyon Treefrog, complete with excellent photos and frog sounds, visit this page from the Reptiles of Arizona website.